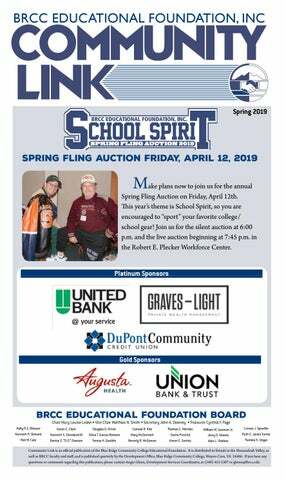 Spring Fling Auction on Friday, April 12th. This year’s theme is School Spirit, so you are encouraged to “sport” your favorite college/ school gear! Join us for the silent auction at 6:00 p.m. and the live auction beginning at 7:45 p.m. in the Robert E. Plecker Workforce Center. 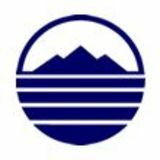 Community Link is an official publication of the Blue Ridge Community College Educational Foundation. It is distributed to friends in the Shenandoah Valley, as well as BRCC faculty and staff, and is published quarterly by the Development Office, Blue Ridge Community College, Weyers Cave, VA 24486. If you have any questions or comments regarding this publication, please contact Angie Glenn, Development Services Coordinator, at (540) 453-2307 or glenna@brcc.edu. family fun, landscaping services, artwork, handmade quilts, jewelry, sports memorabilia, and tickets for plays and sporting events. Join us for a fun night of bidding and help BRCC raise funds to respond to educational needs of the central Shenandoah Valley! Tickets for this event are $75, and space is limited. If you would like to attend or sponsor the event, or donate an auction item, please contact Sally Jane Conner at (540) 453-2203 or conners@brcc.edu. In addition to our sponsors already featured, the Foundation would also like to recognize Silver Sponsors: Alpha Omega Wealth Management, Bowman Family Dentistry, Clark & Bradshaw, Dental Health Associates, Interchange, John L. Matherly, CPA, McDonalds/ Boxley Organization, and Riddleberger Brothers, Inc., as well as Bronze Sponsors: John and Sandy Downey, Eagle Carpet, Inc., Eddie Edward Signs, First Citizens Bank, Hollister Inc., Houff Transfer, Inc., Jim and Pam Huggins,Tim and Nancy Hulings, Kjellstrom+Lee Construction, LD&B Insurance and Financial Services, Flora Pettit, Massanutten Resort, Cynthia Page and Ray Alderfer, Lumos Networks, SEGRA, and Weaver Insurance & Financial Advisors. Please visit the event website at http://www.brcc.edu/edfound/sf for an up-to-date listing of sponsors and items donated. Sampling of auction items: • Vera Bradley Parisian paisley duffle bag. Donated by Susie Shomo. • Gourmet cooking class for eight. Donated by Tassie Pippert, Harrisonburg. • One year, unlimited cloth car washes. Donated by Petersons Car Wash, Staunton. • Two gift certificates for three scoops of mulch. Donated by Blue Ridge Lumber Co., Fishersville. • Lithographed signature/picture of Cameron Heyward. Donated by Pittsburgh Steelers. • Autographed photograph of Dwight Howard. Donated by Washington Wizards. • Autographed photograph of Joe Flacco. Donated by Baltimore Ravens. • WHSV Studio Tour. Donated by WHSV TV3, Harrisonburg. • Monticello house tour and private tour of the upstairs and grounds for two. Donated by Mary Louise Leake. • Waterproof portable Bluetooth speaker. Donated by Crutchfield. • Overnight stay for two. Donated by The Omni Homestead, Hot Springs. • Lady’s Seiko watch. Donated by Lemon’s Jewelry. • 1982-1990 White House Christmas Card memorabilia. Donated by Susan W. Bevins. • Machine pieced and quilted “Jacob’s Ladder” quilt. Donated by Catherine D. Matherly and Bonnie Spoon. • Four recreation passes. Donated by Wintergreen Resort. • High-fired stoneware. Wheel thrown & altered. Donated by Terry Porter, Crickhollow Pottery. • Emilio’s Italian Restaurant gift card. Donated by Emilio’s Italian Restaurant, Staunton. • Four 18-hole green fees. Donated by Heritage Oaks Golf Course, Harrisonburg. Bob Baldygo, now retired BRCC VP of • Stoneware bowl. Wheel thrown and donated by Phill Ungar, Finance and Administration, sports his Cedar Hill Pottery. Syracuse orange at a 2012 Foundation event. •	Family membership. Donated by Explore More Discovery Museum, Harrisonburg. s a youngster in his native Eritrea, Gebrehiwot Amine, better known as “G,” enjoyed helping his grandfather on the farm, often taking things apart to learn how they worked. “I was very curious about mechanics and electrical things,” says G. “I would ask my grandfather to show me his tools. I also liked to put together models.” G is an 18-year-old senior at Harrisonburg High School, and by participating in the Career Pathways program, is also studying Mechatronics at Blue Ridge Community College. He spends part of his days at the high school finishing requirements like government, and then travels to BRCC for hands-on excitement using the state-of-the-art equipment in the labs of the Advanced Technology Center. “I didn’t know anything about mechatronics, but my career coach encouraged me to check it out,” G recalls. “I took a tour of the facility and I could see this is what I really wanted to do.” Darcy Bacon, Harrisonburg High career coach, says, “G is an amazing young man, always smiling, and his positive attitude is contagious. He is the perfect candidate for the Career Pathways program because he works hard and is excited for his future career.” G says he enjoys spending time in both “worlds” of high school and college. “BRCC has been such a positive experience. People are so friendly and respectful. The culture is very mature.” Three of his older siblings (Abrham, Aster, and luwam) have attended BRCC as well, preparing for careers in healthcare. Jim Russell, assistant professor of Manufacturing Engineering Technology & Mechatronics, says of working with G in the classroom: “When I think of G, I immediately think of energy. With tools in hand, he jumps into the assignment and upon my checking and providing positive feedback for completing the task correctly (which he routinely does), I ready myself for the fist bump that I know is coming.” This very industrious young man already works two jobs in retail and food service, and now is applying for a third that fits nicely with his field of study: mechanical assembly. “I know I will be busy, but I really want the experience.” According to Russell, the Advanced Manufacturing Technology Program prepares students for the more than 500 current job opportunities in the manufacturing sector within 50 miles of Harrisonburg. In order to bring fresh water to an isolated village in Kiserian, Kenya, the Blue Ridge Community College National Society for Leadership and Success (NSLS) Team and Enactus Team students are raising funds to drill a well. In partnership with Well of Hope, the groups have established a GoFundMe page (https://www.gofundme.com/water-for-hope-andchange) with a goal of $30,000 to drill one well. Alejandra Mendez, a part-time BRCC student, is passionate about this project because of similar experiences in her native Mexico on her grandparents’ farm, where water is also scarce and requires daily effort to acquire it. “I believe I am stronger because of my past and I believe helping these women and their families will help me grow into a stronger person,” says Alejandra. “These women are isolated and get no help from anyone because they have HIV. We have the power and knowledge to help these women and their families by making it easier for them to access water. By helping these women, I hope to feel like I made a difference in someone’s life.” The residents of the remote settlements of Kiserian, Kenya, are HIV-infected women and their children. The closest water source is a strenuous five-hour walk away. That’s a 10hour round trip to collect the most basic of human needs for survival. Over the past four years, BRCC students have worked with these women by training them to make products such as solar lights, biomass briquettes, and soap to earn income. While these projects were certainly successful, they realized that solving their lack of water was most pressing. Access to clean water through having a well close by will enhance the efforts of these families to raise livestock and agricultural products, and also earn extra money by selling water. If your church or community organization would like to learn more, contact Rebecca Evans at 540-453-2366 or evansR@brcc.edu to schedule a presentation by NSLS and Enactus students. hanks to your support and generosity, during the 2018-19 academic year more than 270 BRCC students have benefited from $370,755 in scholarships awarded through the BRCC Educational Foundation. ith your continued support, BRCC students are able to make their educational dreams come true. The Blue Ridge Annual Fund provides steady scholarship support, as well as funding for instructional technology, faculty innovation and staff professional development, improving the educational experience for all students. If you want to be a part of building the dreams of today’s students while ensuring them one of the finest educations available, then make your gift to the Blue Ridge Annual Fund. Online giving has never been easier! Scan this code to make a donation now to the BRCC Educational Foundation, Inc.
April 17, 2019, 6:00 a.m. to 8:00 p.m. Can we count on your support for the Great Community Give event on April 17th? Plan on rallying your friends and supporting your favorite charity (us!) as part of one of the biggest online days of giving in this area. Start now by “Liking” BRCC on Facebook at https://www.facebook.com/Blue-Ridge-Community-CollegeVirginia-131450979820/, and stay tuned for details! Then on April 17th, support BRCC online at https://hrgcg.givebig.org/c/HRGCG/a/brcc. AmazonSmile is a simple and automatic way for you to support your favorite charitable organization (us!) every time you shop, at no cost to you. When you shop at smile.amazon.com, you’ll find the exact same low prices, vast selection and convenient shopping experience as Amazon.com, with the added bonus that Amazon will donate a portion of the purchase price to your favorite charitable organization. To shop at AmazonSmile simply go to smile.amazon.com from the web browser on your computer or mobile device. You may also want to add a bookmark to smile.amazon.com to make it even easier to return and start your shopping at AmazonSmile. Every little bit counts! When you shop at smile.amazon.com, charitable donations quickly add up. Remember, only purchases at smile.amazon.com (not www.amazon.com or the mobile app) can support the BRCC Educational Foundation.